英文摘要：Reproductive character displacement (RCD) is a phenomenon of character evolution to reduce the reproductive interactions between species. It is one of the important strategies for sympatric species to deal with the interspecific reproduction interference by using diverse reproductive traits to maintain the species boundary. Anuran species mainly rely on sound communication for breeding. In this research, we studied RCD by using the call of Chiromantis doriae. C. doriae and Feihyla vittata belong to different genus in Rhacophoridae. However, these 2 species have similar morphologies, male call spectral characteristics, breeding seasons and breeding micro-environments, which indicates the reproductive interference to some extent. We chose C. doriae as the research object, to compare the call parameters with the sympatric and allopatric C. doriae. We obtained 3 principal components from 8 call parameters. Mixed linear model analysis showed that only the PC3 which is related to the temporal cues and frequency modulation, was significantly different between the 2 sympatric and allopatric populations. In note parameters, the results of mixed linear model analysis showed that the main frequency and duration of note were significantly different between sympatric and allopatric populations, and no significant difference was observed in note interval. In general, sympatric population had lower domain frequency, longer duration and more obvious frequency modulation than allopatric population, which helped the sympatric C. doriae to enlarge the discrepancy between conspecific signal and monosyllabic call of F. vittata with high dominant frequency and short duration. Our results demonstrate that RCD exists in the sound communication of C. doriae, or even in unrelated species, which expands the range of RCD in nature. Boersma PPG. 2002. Praat, a system for doing phonetics by computer[J]. Glot International, 5(9/10): 341-345. Brown WL, Wilson EO. 1956. Character displacement[J]. Systematic Zoology, 5(2): 49-64. 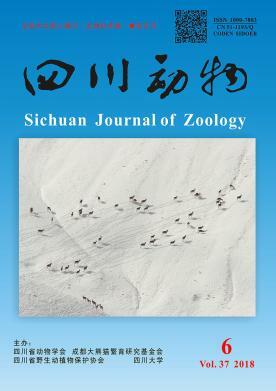 Cui JG, Song XW, Zhu BC, et al. 2016. Receiver discriminability drives the evolution of complex sexual signals by sexual selection[J]. Evolution, 70(4): 922-927. Gerhardt HC, Huber F. 2002. Acoustic communication in insects and anurans[M]. Chicago: University of Chicago Press. Gerhardt HC. 2013. Geographic variation in acoustic communication: reproductive character displacement and speciation[J]. Evolutionary Ecology Research, 15: 605-632. Gordon NM, Ralph MZ, Stratman KD. 2017. Rapid character displacement of different call parameters in closely related treefrogs (Hyla cinerea and H. gratiosa)[J]. Behavioral Ecology and Sociobiology, 71(112): 1-8. Gröning J, Hochkirch A. 2008. Reproductive interference between animal species[J]. Quarterly Review of Biology, 83(3): 257-282. Höbel G, Gerhardt HC. 2003. Reproductive character displacement in the acoustic communication system of green tree frogs (Hyla cinerea)[J]. Evolution, 57(4): 894-904. Jang Y, Gerhardt HC. 2006. Divergence in female calling song discrimination between sympatric and allopatric populations of the southern wood cricket Gryllus fultoni (Orthoptera: Gryllidae)[J]. Behavioral Ecology and Sociobiology, 60(2): 150-158. Kime NM, Burmeister SS, Ryan MJ. 2004. Female preferences for socially variable call characters in the cricket frog, Acris crepitans[J]. Animal Behaviour, 68(6): 1391-1399. Klump GM, Gerhardt HC. 1987. Use of non-arbitrary acoustic criteria in mate choice by female gray tree frogs[J]. Nature, 329(19): 286-288. Lee KH, Shaner PJ, Lin YP, et al. 2016. Geographic variation in advertisement calls of a Microhylid frog-testing the role of drift and ecology[J]. Ecology and Evolution, 6(10): 3289-3298. Lemmon AR,Smadja C, Kirkpatrick M. 2003. Reproductive character displacement is not the only possible outcome of reinforcement[J]. Journal of Evolutionary Biology, 17(1): 177-183. Lemmon EM. 2009. Diversification of conspecific signals in sympatry: geographic overlap drives multidimensional reproductive character displacement in frogs[J]. Evolution, 63(5): 1155-1170. Li JT, Li Y, Klaus S, et al. 2013. Diversification of rhacophorid frogs provides evidence for accelerated faunal exchange between India and Eurasia during the Oligocene[J]. Proceedings of the National Academy of Sciences of the United States of America, 110(9): 3441-3446. Márquez R, Bosch J. 1997. Male advertisement call and female preference in sympatric and allopatric midwife toads[J]. Animal Behaviour, 54: 1333-1345. Penna M, Feng AS, Narins PM. 1997. Temporal selectivity of evoked vocal responses of Batrachyla antartandica (Amphibia: Leptodactylidae)[J]. Animal Behaviour, 54: 833-848. Pfennig DW, Pfennig KS. 2012. Development and evolution of character displacement[J]. Annals of the New York Academy of Sciences, 1256: 89-107. Pfennig KS, Pfennig DW. 2009. Character displacement ecological and reproductive responses to a common evoluation problem[J]. Quarterly Review of Biology, 84(3): 253-276. Pfennig KS, Rice AM. 2014. Reinforcement generates reproductive isolation between neighbouring conspecific populations of spadefoot toads[J]. Proceedings of the Royal Society B: Biological Sciences, 281(1789): 20140949. Pfennig KS, Ryan MJ. 2007. Character displacement and the evolution of mate choice: an artificial neural network approach[J]. Philosophical Transactions of the Royal Society B,362(1479): 411-419. Pfennig KS. 2003. A test of alternative hypotheses for the evolution of reproductive isolation between spadefoot toads: support for the reinforcement hypothesis[J]. Evolution, 57(12): 2842-2851. R Core Team. 2017. R: a language and environment for statistical computing[CP/OL]. (2017-03-06)[2018-1-11]. https://www.R-project.org/. Schlüter D. 2001. Ecological character displacement[M]//Fox CW, Roff DA, Fairbairn DJ. Evolutionary ecology: concepts and case studies. New York: Oxford University Press: 265-276. Schwartz JJ. 1987. The importance of spectral and temporal properties in species and call recognition in aneotropical treefrog with a complex vocal repertoire[J]. Animal Behaviour, 35: 340-347. Siegert ME, Romer H, Hartbauer M. 2013. Maintaining acoustic communication at a cocktail party: heterospecific masking noise improves signal detection through frequency separation[J]. Journal of Experimental Biology, 216(24): 4655-4665. Slatkin M. 1980. Ecological character displacement[J]. Ecology, 61(1): 163-177.